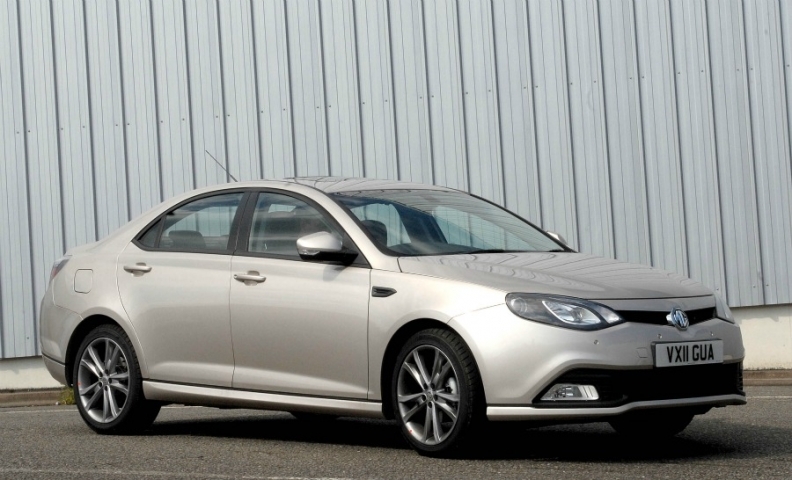 Shanghai Auto is testing the European market with its new MG6 sedan assambled by its MG Motor subsidiary in England. GOODWOOD, England -- MG Motor UK is targeting used-car buyers -- and especially BMW 3-series owners -- with its new MG6 sedan, which will go on sale in the UK in July and mainland Europe next year. The sedan will join the MG6 hatchback as the second new model launched by MG Motor, formerly Britain's largest domestic carmaker, which is now owned by SAIC, China's biggest domestic carmaker. With the MG6, SAIC is taking its first steps toward expanding the MG brand across Europe. MG has a range of six new models is at various stages of launch or development, including the MG3 small hatchback, MG5 compact and an SUV-style crossover to rival the Nissan Qashqai. The company will advertise the MG6 sedan on Britain's biggest used car Web site, Auto Trader, where last year the most searched-for car was the BMW 3-series sedan. The MG6 sedan is a similar length to the 3-series and buyers of used 3-series are among the target group for the MG6, along with current owners of a Jaguar X-Type or Rover 75. The MG6 sedan will be priced at 15,995 pounds (nearly 18,200 euros), 500 pounds more than the MG6 hatchback. MG Motor pitched the sedan slightly above the MG6 fastback because people who attended customer clinics said the sedan "was more prestigious, more premium," than the hatchback, Guy Jones, the company's said sales and marketing director, said at the car's press launch here. MG Motor will add more equipment on the high-spec SE and TSE versions than is available on the hatchback. To draw parallels between sporting sedans from the company's heritage, upscale versions of the MG6 sedan will be offered with a Magnette badge firast used on MG race cars in the 1930s. "It's the most famous name in our history for four-seat, four-door cars," Jones said. The MG6 sedan and hatchback will be offered with a 1.9-liter diesel engine developed by SAIC at the end of next year. With the introduction of the diesel version at the end of next year, both cars will be launched in mainland Europe. Arriving in 2013 will be a six-speed manual transmission to replace the current five-speed. The MG6 will not have an automatic transmission option. Technology: Electronic stability control, hill-hold function, air conditioning, remote locking (all standard), satellite navigation (on high-end models). The MG6 models are assembled in Longbridge, near Birmingham, England, using bodyshells, engines and powertrains shipped from China by SAIC. MG expects to sell 1,000 units of the MG6 line this year, half of which will be the sedan version and the other half the hatchback. The brand predicts sales will rise when the engine lineup is expanded in coming years.